Up to 40-50% of new mums will experience hair loss after giving birth, and postpartum hair loss is more common than most women realise. 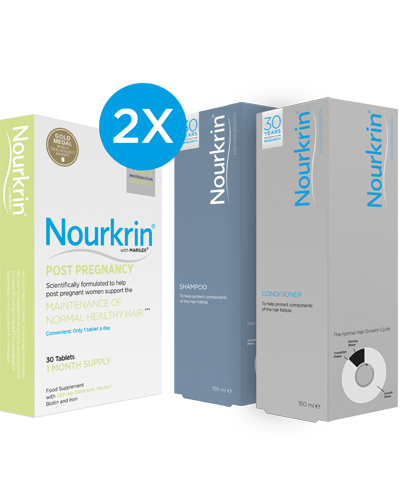 Nourkrin® Post Pregnancy is for all women, who have given birth within the past 9 months. I’m so impressed. I started taking these [Nourkrin® Post Pregnancy] tablets with an open mind, as nothing I have ever used has worked before, however I’ve been shocked at the results. My pregnancy hair was the best it has ever been – the thickest and strongest – but when I had my son, in the months after, I started losing it in handfuls. Within three days of taking these tablets, there was at least an 80% reduction in my hair loss. No more brushes and plugholes of hair! I’m amazed. I can’t recommend enough. Postpartum hair loss is experienced between 2 to 4 months after childbirth. 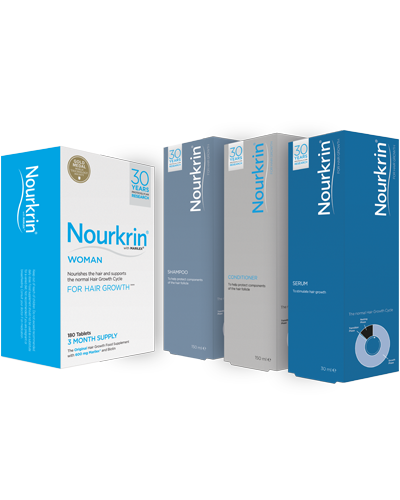 As such, it is advisable that Nourkrin® Post Pregnancy is started within the first 4 months after giving birth and continued until you are content with the quality and texture of your hair. Nourkrin® Post Pregnancy is completely safe and 100% drug-free. Marilex® (fractionated fish extract with specific lectican proteoglycans), ferrous fumerate, D-biotin, bulking agents (microcrystalline cellulose; calcium hydrogen phosphate), stabilisers (hydroxypropyl methyl cellulose; talc; glycerol), glazing agents (magnesium salts of fatty acids), colours (titanium dioxide). Subscribe to our newsletter to stay up to date on the newest research within the field of hair growth disorders and female hair loss, information about upcoming events and competitions with Nourkrin® Post Pregnancy.